The central square of Marrakech Jemaa El-Fna is one of the best places to see Morocco as it is and meet the Moroccans as they are. Times change but the show on this old square goes on. The Moroccans still keep to their old traditions and cultural heritage which made UNESCO take Jemaa el-Fna on their World Heritage list. Jemaa el-Fna is the center and the symbol of Marrakech. A chaotic place that every visitor wants to see. What most tourists don’t think about is gruesome past of Jemaa el-Fna. The square originally was a place for executions and the heads of criminals were hanging here on spikes. That’s what the square’s name also tells, Assembly of the Dead. I’m happy for not understanding the Moroccan language. If I did I would never come to see this square. 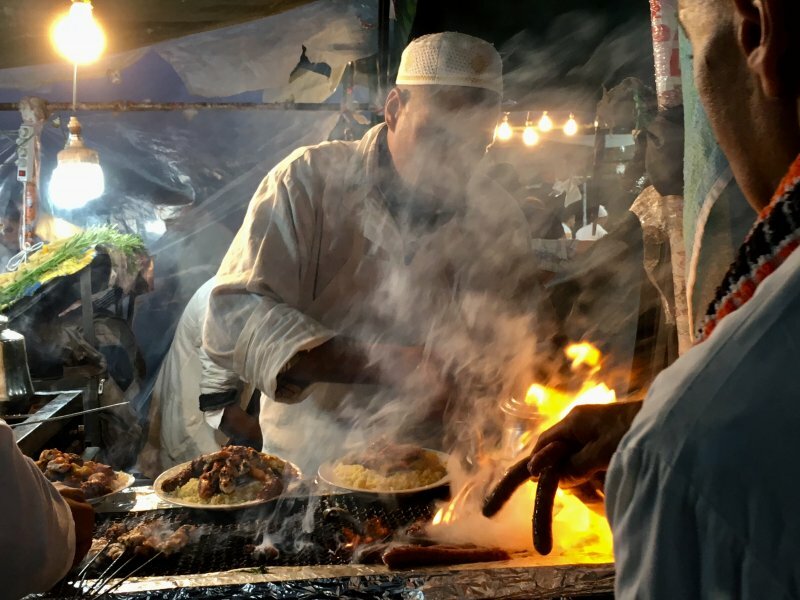 The focus of Jemaa el-Fna then changed and the square became a marketplace and an open are dining place Marketplace at daytime and shows and dining at nights. The place in Marrakech where they all comes, share their stories, dine and watch showmen with family and friends. 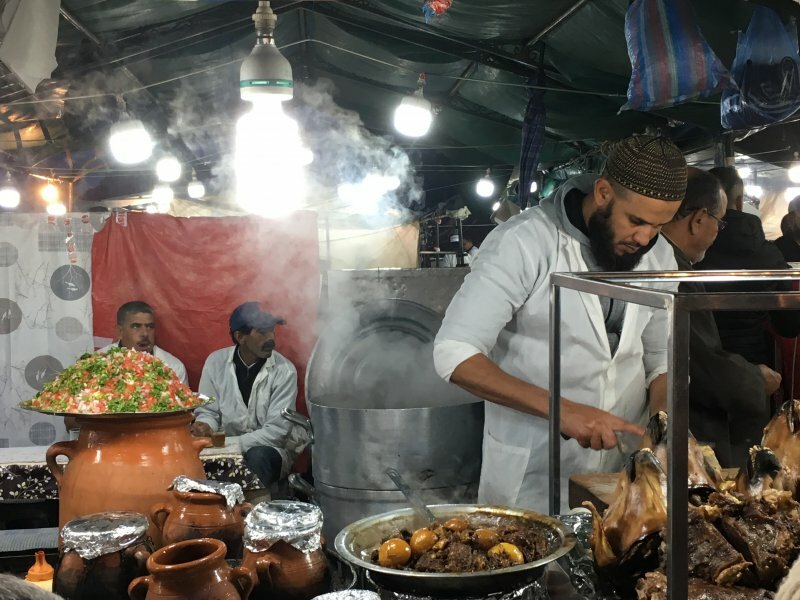 Snake charmers, monkey trainers, folk musicians, fortune tellers, tooth pullers – and Moroccan food. Such variety of shows going on that there was a reason for UNESCO to take Jemaa el-Fna on their list. That was for the rich cultural heritage and the ways it’s expressed on the square: music, dance, food, rituals and mythologies. By taking objects on their list UNESCO wants to encourage communities to preserve their heritage. The specific list where Jemaa el-Fna is included is called Masterpiece of the Oral and Intangible Heritage of Humanity and this list contains a long row of other remarkable cultural environments as well. You can find the whole list on the UNESCO website. The map shows you the irregular square of Jemaa el-Fna in the old town of Marrakech. On the north side of the square are the bazaars, the souks that are worth a visit as well. And at the opposite end is the Koutobia Mosque, a Marrakech landmark and the highest building in the pink desert city. As you enter the square these horse carriage men will approach you and offer you a ride. But you won’t need that on the square. But you can take a horse tour afterwards if you want to see the city. Koutobia mosque, the highest building of Marrakech. If you find the mosque you will find Jemaa el-Fna. The square is in a walking zone but there are cars, bikes, trucks, carriages, donkeys and horses. Wonder what this stall sells? These men are selling healing products. Like here, fruits in neat piles. Is my couscous ready to be served? Just perfect. Hot and tasty. Fruit sellers stay here all day long. Want some dates and dried fruits for dessert? So this was my Jemaa el-Fna photo tour, hope you liked the tour. For more photos on Jemaa el-Fna check out my post The Top Things to Do in Marrakech. And for the souks north of the square check out my post Getting Lost in the Souks of Marrakech.